The latest film from Roman Polanski is slated for Blu-ray release in March. 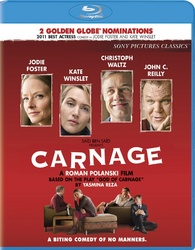 In an early announcement to retailers, Sony has slated 'Carnage' for Blu-ray on March 20. Two pairs of parents hold a cordial meeting after their sons are involved in a fight, though as their time together progresses, increasingly childish behavior throws the evening into chaos. The Blu-ray will feature 1080p video, a DTS-HD Master Audio 5.0 soundtrack, and supplements include: Actors' Notes, An Evening with John C. Reilly and Christoph Waltz, and On the Red Carpet. Suggested list price for the Blu-ray is $35.99. You can find the latest specs for 'Carnage' linked from our Blu-ray Release Schedule, where it's indexed under March 20.